The great Brian Distelberg, a PhD candidate in history at Yale, returns today to these pages. In case you missed it, check out his musings on Connecticut. And check out his own website, where he writes about his research, contemporary politics and culture, and LGBT issues. The Boy Scouts of America (BSA) turns 100 this year, and as Katherine Q. Seelye recently observed in the New York Times, the anniversary finds the Scouts facing “a host of issues”: plummeting membership (from a 1973 peak of 4.8 million to 2.8 million now), an $18.5 million jury verdict stemming from a sexual abuse case, and ongoing challenges to its exclusion of atheists, gay people, and girls under 13. Although now a quarter-century old, Rosenthal’s diagnosis remains surprisingly applicable to the case of Scouting in the United States. David Macleod’s social history Building Character in the American Boy: The Boy Scouts, the YMCA, and Their Forerunners, 1870-1920 (1983) examines the Scouts’ Progressive-era origins, and Jay Mechling analyzes a contemporary Scout troop’s summer camp rituals in On My Honor: Boy Scouts and the Making of American Youth (2001). A few unpublished dissertations also cover the organization’s early years. 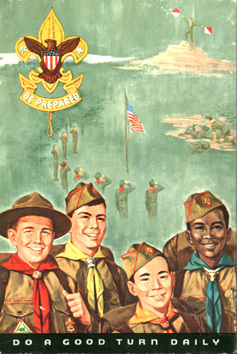 But large swaths of the Boy Scouts’ history, including the wartime and Cold War decades when it enjoyed its greatest popularity, remain largely unexplored—to the detriment of our understanding of American political conservatism, youth culture, suburbanization and recreation, and masculinity and male sexuality, among other topics. Lack of easy access to BSA organizational records is, of course, a major obstacle. (The National Scouting Museum, which moved to its current Irving, TX, location in 2002, offers few useful exhibits on its website, and researchers must apply, and pay a daily usage fee, to examine to its holdings.) But the digital archive can provide inquiring historians an alternative means of exploring the organization’s place in American society, particularly as revealed through the voluminous print culture produced by and about the Scouts in its century of existence. 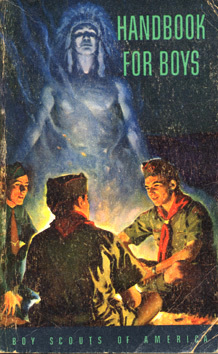 The Boy Scout Handbook is probably the best known of these publications. 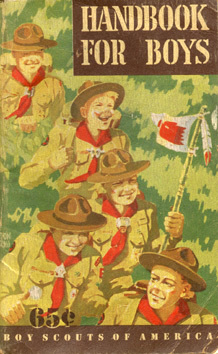 The handbook, which sets out and explains the Scout Oath and Law, describes the requirements to advance from rank to rank, and offers information on subjects from camping to fitness to good citizenship, has passed through twelve editions since 1910. (It carried the title Handbook for Boys until 1959.) 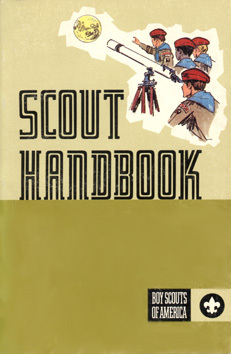 Jeff Snowden, scoutmaster of Troop 97 in Fort Collins, Colorado, maintains a detailed online compendium of images of Boy Scout, Scoutmaster, and other Scout handbooks. The images, which accompany Snowden’s study of the handbook’s evolution, reveal telling shifts in the Scouts’ self-presentation and traces of wider social changes.